VARIETIES (round beets require 60-70 days and cylindrical beets 70-80 days depending on planting date, sizes desired and season). Processor specifies; varieties used are: Detroit Short Top and other strains such as Ruby Ball and Scarlet Supreme. Hybrid: Red Ace F1 (Cercospora tolerant). For trial, round: Big Red, Pacemaker III, Warrior. For trial, cylindrical: Forono and Cyndor (half long), CXA 9026, Cylindra, Formanova. Note: Hybrid beets have the advantage of greater seedling vigor and improved top growth and resistance to certain diseases such as Cercospora. On the negative side, the vigor of hybrid beets may result in beet roots going "out of grade" more quickly if harvest is delayed by poor weather or other reasons. Cylindrical beets offer greater uniformity and efficiency of sliced beet production, a major pack requirement for processors. Beta vulgaris Orientalis group, a form of common table beet or leaf beet, grown for its succulent leaves which can be harvested over an extended period. Sugar beet leaves may also be used as for "greens" and are considered superior to table beet leaves. Beets grow well on sandy loam, silt loam, or muck soil. They may be grown on heavier soiltypes, but harvesting is more difficult and root growth may be impaired. Uniform soil moisture is essential for best quality. Rotate crops to avoid damping-off and root rot diseases. Beets are sensitive to damping off on soils that may flood or otherwise have poor aeration. Adjust soil pH to 6.0 or higher for maximum yields. Follow soil test recommendations for liming rates. Fields in which processing beets are to be planted are usually tested by the processor for residues of chlorinated hydrocarbons and rejected if these residues are found to be unacceptable. 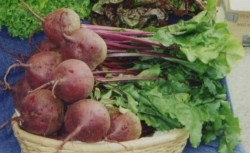 In western Oregon, table beets may be planted from about March 20 to July 10. Table beet seed numbers approximately 1,600 per ounce. Seed is size graded with sizes 9 and 10 (64ths of an inch), ranging from 28,000 to 32,000 seeds per pound being preferred when planting beets for processing. Using a limited size range of seed simplifies planter calibration and proper plant stand establishment. Use treated seed only to reduce losses from damping off and other seedling diseases. Plant seed l/2 to 3/4 inch deep in rows 18 to 24 inches apart. About 15-25 lb/acre of seed are required. From 15-30 seedlings/foot may be desired, depending on size grade and earliness wanted. Beets mature more quickly when plant stands are thin and later when plant populations are high. Yields and grades are directly influenced by plant stand and harvest date. Beets intended for early harvest should be planted to produce 15-20 seeds/foot of row. Beets for mid-season harvest and late harvest are planted to produce 20-25 and 25-30 plants/foot of row respectively. For orderly commercial harvest of the needed size grades and harvest season, processing companies establish or suggest seed sizes, seeding rates, as well as planting and harvest dates. Growers sometime plant more than one plant density in a field to allow for an extended harvest period. In western Oregon, beets for processing are planted from about April 1 to about May 30. John Deere flexiplanters, Planet Jr., and Stanhay planters are most commonly used. Since beet seed is multi-germ, (producing 1-3 seedlings per seed ball), precision planting has not been considered important. However, recent studies by Oregon State University indicated that even with multi-germ seed, sizes tend to be much more uniform with precision planting and high densities. This research evaluated the possibility of closer row spacings (12 inces between rows and 24 seeds per row foot), flail topping, and the use of non row-oriented harvesters (similar to potato diggers) and results of two years of trials were very promising. These included satisfactory overall yields of high-grade beets and higher dollar returns/acre in comparison with conventionally spaced beets harvested with Scott-Viner type harvesters. For fresh market beets, plants should be 2-3 inches apart. Six to 8 lb seed/acre are sufficient. The planting season may extend through the month of June. Baby beets: Small beets intended for whole pack and pickled packs may be produced by reducing the spacing between rows to about 10-15 inches and maintaining about 30-35 plants/foot of row. More commonly they are sorted out of the regular harvested product in normal processing operations. See the guide, fertilizer guide Table Beets: Western Oregon—west of Cascades for fertilizer recommendations. Nitrogen is important in maintaining the top growth needed for efficient harvest since traditional harvesting equipment handles beets by their tops. Irrigate carefully, especially early in the season so as not to overwater beets. Water logging can cause beet leaves to turn red and plants to stop growing for a time. A total of 12-14 inches of water may be needed in western Oregon. Soil type does not affect the amount of total water needed, but does dictate frequency of water application. Lighter soils need more frequent water applications, but less water applied per application. Excessive irrigation or moisture early, can result in damping-off and other seedling disorders. Water deficiency however, can aggravate boron deficiency. Moisture management in beets is especially important during stand establishment, the early growth stage, and during root expansion. Since small beet seeds are unable to emerge when surface crusting occurs, irrigation during the pre-emergence period revolves around maintaining a loose soil surface. This often requires frequent, light irrigation. Conversely, deep, excessive irrigation which results in anaerobic soil conditions can cause damping off of emerging seedlings during emergence and temporary cessation of growth in young plants. In the remainder of the season, available soil moisture should not be depleted by more than 50 percent.1 As beet roots develop most of their size in the last half of their growth period, irrigation is especially critical during this time. Water deficit during this period will have the greatest negative impact on yields. A balance must be struck, however, between maintaining adequate moisture while minimizing wetness in the canopy that promotes the common fungal diseases alternaria, cercospora, and ramularia. During the last half of the growing period, irrigate only early in the day to allow for rapid canopy drying whenever possible. The peak water use for beets, which occurs in July, is approximately 0.21 inches per day. On most soils, weekly irrigation during the peak is adequate. With with sandy and sandy loam soils, however, irrigation may be required as frequently as every three to four days. Table beet roots occasionally suffer from a disorder known as "zoning," in which there are alternating red and pale bands in a root cross-section. The pale areas do not accumulate the deep red anthocyanin pigment normally associated with red beets and rings may remain nearly colorless or white. This disorder is most pronounced in hot weather and when table beets are grown in climates to which they are not well-adapted. Most commercial beet production is in Oregon, New York, and Wisconsin, or in more southerly states during the cooler parts of the year. Contributing factors in zoning are high temperature and variety. Moderate high temperatures and cool nights favor good pigment development and decrease incidence of zoning. Varieties commonly grown in Oregon, such as 'Detroit Dark Red Short Top', 'Scarlet Supreme', 'Red Ace', and 'Warrior' are not susceptible to zoning under our summer growing conditions. Some garden-oriented seed companies offer zoning-susceptible varieties as novelty items. Table beet harvest for processing generally extends from about July 15 to the end of October, but may extend into November. The prime harvest period is between August 1 and October 1. Individual fields may be harvested over a several week period. Yields of processing beets average approximately 18 tons/acre with good yields approximately 25 tons/acre. Fresh market beets are reported to average 140 cwt/acre with good yields of 200 cwt/acre. Beets for processing may be stockpiled for several days without serious deterioration but this is not usually recommended. Roots should be reasonably dry and free of soil for best results. For longer storage, proper storage facilities are needed. Beets are usually harvested and topped by custom-built machines which may be tractor pulled or self propelled. However, beets can be harvested with single or multiple-row harvesters. Because of the slowness of Scott-Viner type harvesters and their high maintenance requirements, table beet growers in Oregon are beginning to use multiple-row diggers similar to potato harvesters. This requires that the tops be removed before digging. Top removal is done in two steps, using a flail to remove leaf blades and as much top as possible without damage to the roots, followed by a sugar beet-topping device with three drums of rubber-fingered flails. The latter removes the remaining leaf blades to within an inch or two of the beet root. Roots are then lifted and loaded into bulk trailers or trucks for transport to the processor. Data from OSU trials in 1997 and 1998 indicate acceptable yields of high-value (small diameter) beets with this system. It is important to consider soil type and weed control and to experiment with the proper interval between toping and digging to allow for the harvest of clean product. Follow processor recommendations for time of harvest. Beets are usually harvested when root size distribution approaches 25% grade 1, 60% grade 2 and 15% grade 3 paid weight, with about 1% culls. Grade 1 beets are 1-1 5/8 inches, grade 2 are over 1 5/8 to 2 5/8 inches and grade 3 over 2 5/8 to 3 1/2 or 4 inches depending on processor requirements. These grade distributions vary from year to year according to the type of product being processed and seasonal variations. In general, grade 2 percentage ranges very little, with most of the yearly or seasonal range differences occurring in grade 1 and grade 3 beets. Beets are hauled from the field to the processor in 10-14 ton loads in double-axle dump trucks. Store beets at 32 F and relative humidity of 98 to 100%. Like other root crops, beets are well adapted to storage. Topped beets stored at 32 F can be expected to keep 4 to 6 months under suitable storage conditions. Either cold storage of cool-cellar storage is suitable, provided the humidity is kept sufficiently high to prevent shriveling. Cellar storage temperatures fluctuate and are often higher than 32 F, so the period of successful storage will be comparatively shorter. The temperature in such storage should not exceed 45 F to minimize sprouting and decay. Beets wilt readily from loss of water, therefore, they should be kept where the humidity is sufficiently high to prevent excessive evaporation. Small beets soften and shrivel earlier than larger ones. Before beets are stored, they should be topped and sorted to remove all those with disease or mechanical injury. Beets should not be stored in large bulk; and they should be stored in well-ventilated containers, such as ventilated bin boxes or slatted crates, to help dissipate respiratory heat. Increasing the carbon dioxide level in beet storages to 5 to 10 % increased fungal spoilage. Bunched beets are much more perishable than topped beets, but they can be stored at 32 F for 10 to 14 days. Use of crushed ice is helpful in keeping the bunched beets cold, especially if refrigeration is not available. Beet greens and other greens are handled like spinach. Because of their perishability, they should be held as close to 32 F as possible. At this temperature, they can be held for 10 to 14 days. Relative humidity of at least 95 % is desirable to prevent wilting. Air circulation should be adequate to remove heat of respiration, but rapid air circulation will speed transpiration and wilting. Satisfactory precooling is accomplished by vacuum cooling or hydrocooling. These leafy greens are commonly shipped with package and top ice to maintain freshness. Research has shown that kale packed in polyethylene-lined crates and protected by crushed ice keeps in excellent condition for 3 weeks at 32 F but only 1 week at 40 F and 3 days at 50 F. Vitamin content and quality are retained better when wilting is prevented. Fresh market beets are usually bunched by hand and are packaged in 35-lb half-crates, or 32-lb 4/5 bushel crates. Beets intended for processing are harvested as needed into self-unloading trucks or bulk truck bodies or trailers for immediate transport and processing.